On this day in history, April 2, 1792, Congress creates the first United States Mint. Creating a coinage system unique to the new United States was seen as a priority to the Founding Fathers because it would help establish the identity of the young nation, as well as encourage commerce. The full name of the act was An act establishing a mint, and regulating the Coins of the United States and it directed that a mint should be built in Philadelphia, which was then the capital of the United States. The Mint Act or the Coinage Act, as it was informally known, created five officer positions to oversee the direction of the mint and the creation of the coinage. The Act directed that the new coins would be based on the decimal system, with the dollar being the chief means of exchange. 10 types of coins were created with the Act: Eagles ($10), Half Eagles ($5), Quarter Eagles ($2.50), Dollars ($1), Half Dollars ($.50), Quarter Dollars ($.25), Dimes ($.10), Half Dimes ($.05), Cents ($.01) and Half Cents ($.005). Eagles were made of gold, dollars and dimes were made of silver and cents were made of copper. Each coin was to have an image symbolizing “Liberty” on one side. The back of the gold and silver coins was to have an image representing “Liberty” on it, while the back of the cents was to have the coins' denomination. Any person could bring in gold or silver bullion and have it minted into coins for free. The Act specified the purity of each type of metal for the coins and created a strict testing system to make sure the coins met the guidelines. Employees of the mint could receive the death penalty for stealing or tampering with the coins. 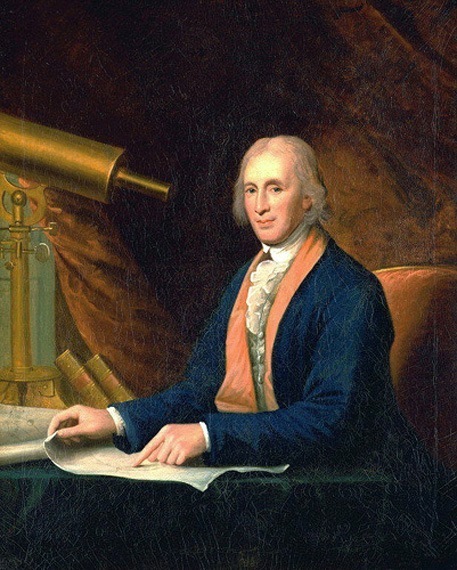 David Rittenhouse, a renowned scientist, mathematician and astronomer was appointed by George Washington as the first director of the Mint. Rittenhouse had served as Pennsylvania's treasurer from 1777 to 1789, giving him much experience dealing with currency. Rittenhouse's first job was to actually build the Mint. He purchased two lots in Philadelphia on July 18, 1792 and construction began immediately. The first building was the smelting building where the metal ores were melted and separated. The second building contained offices, vaults, weighing rooms and the presses for striking the coins. A third building contained a horse-powered mill where the metal was rolled into sheets. The first coins minted were made from silver flatware donated by George Washington himself. Rittenhouse struck the coins himself to test the new equipment and delivered the coins to Washington. The smelting and mill buildings were destroyed by fire in 1816 and these functions were moved elsewhere. 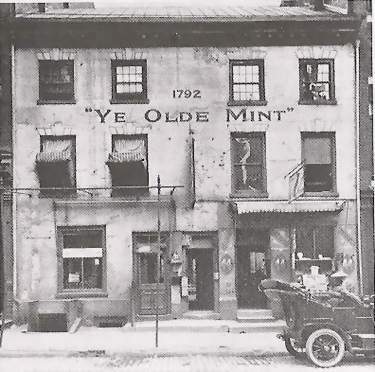 The main office building, however, with “Ye Olde Mint” painted on its side, remained as the United States Mint until 1833 when a larger facility was built. This original Mint building stood until the early 1900s. It was the first building constructed by the US government after the ratification of the US Constitution.